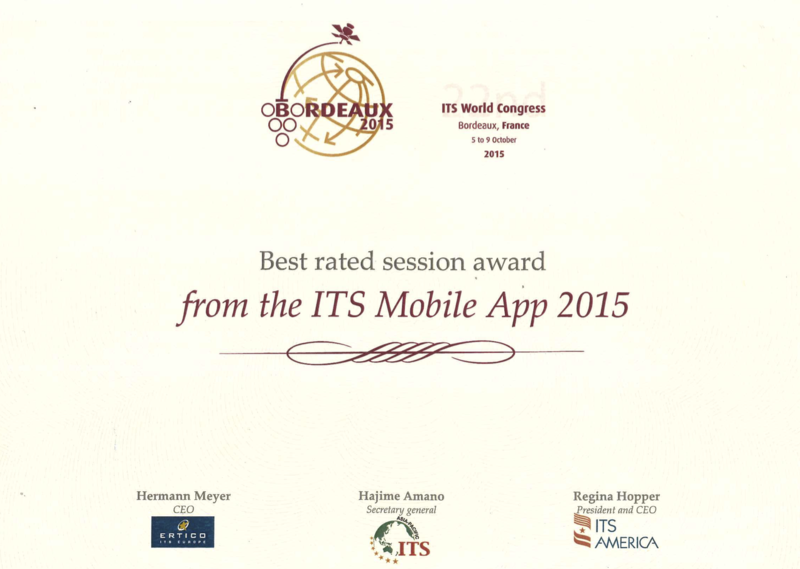 The session SIS25 on “theoretical and technical challenges for automated” won the Best rated session award at ITS World Congress 2015 in Bordeaux. This session has been the opportunity to present the theoretical and technical challenges for automated driving from different perspectives. Indeed the speakers were coming from all around the world, and with an academic or industrial focus. The Chair Drive for All was well represented during this session (PSA Peugeot Citroën, Valeo, Shanghai Jiao Tong University, University of California at Berkeley and MINES ParisTech). This award is a strong encouragement for the research carried out in the Chair Drive for All. Automated driving research has been up to now mainly concentrated on sensor-based vehicle automation. Most current automated vehicles are therefore performing autonomous driving meaning every driving decision is taken within the vehicle. While sensor based systems have demonstrated automated driving in platooning scenarios, highly automated driver assistance or driving in unstructured environment, fully automated driving in broader contexts still requires further research and development. Much effort needs to be undertaken to achieve safety performance superior to that of a human driver, despite the inferior general cognitive capabilities of computers with respect to humans, and this is a prerequisite to creating the public acceptance and trust needed for their deployment. This session aims at providing some insight of what research labs and automotive industry have identified as the next key steps, how research handles these problems and how the results are being integrated into automotive roadmaps.